This week we started to hang the "Italian Ceiling" which we have been painting on canvas in the studio for the last several months. 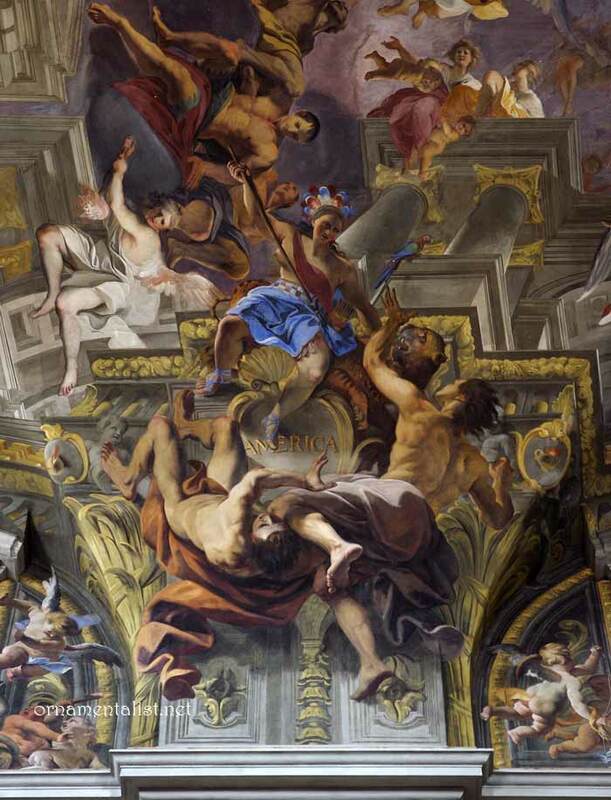 I am elated that my fabulous installer Peter Bridgman, who has been living in Florence the last year or more studying art restoration techniques, came home just in time to help me with this project. Each ceiling panel is pasted with clay based adhesive and allowed to dry. 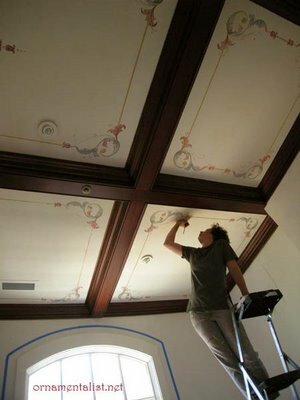 The back of the canvas is then moistened with water, and a second, fat coat of paste put on the ceiling just before the canvas is applied. In the longest panel we found that the chandelier electrical box was not actually in the center. Bad news, since an elaborate rosette was painted for the center. This is always a danger when painting canvases for ceilings that have not yet been framed. No matter what the carpenters tell you about how perfect their measurements are, they are never, ever correct. 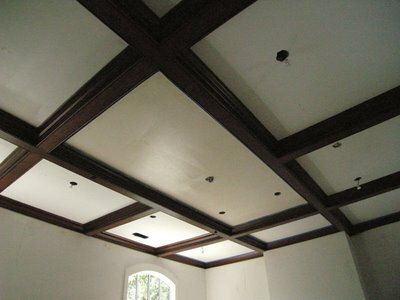 That's why the design of this ceiling incorporated a lot of "bleed" on the outside edges. Peter's technique is to find the "priority" edge and work from there. Sometimes the priority is the "center", and sometimes is the spot that makes the ornament line up with the ornament in the next coffer. Some pulling and adjusting and language is usually needed. Most of the panels, however, seem to smooth out like butter on bread. Once the canvases are smoothed into place they are left to rest while they tighten; they are then trimmed neatly to fit perfectly. My assistants and I paint the lighting trim, vent covers, etc. to match, and touch up or embellish wherever needed. After today the false floor that allowed us access to this part of the 22 foot high ceiling is being removed, so we were in a crush to get that area finished. Marouflage is in the glossary!